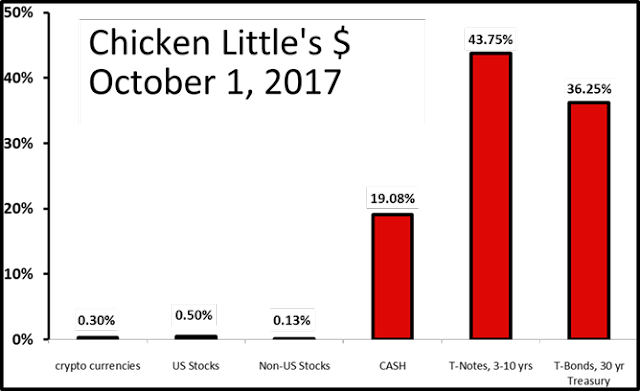 Chicken Little had a modestly winning month in October 2017 to continue a modestly winning year. All risk assets were positive in the month led by bitcoin's stunning 39.74% gain (in the month). Global equities continue their relentless rise, with the Dow Jones industrial average YTD return of over 20% making it the worst performing stock market covered by Chicken Little. 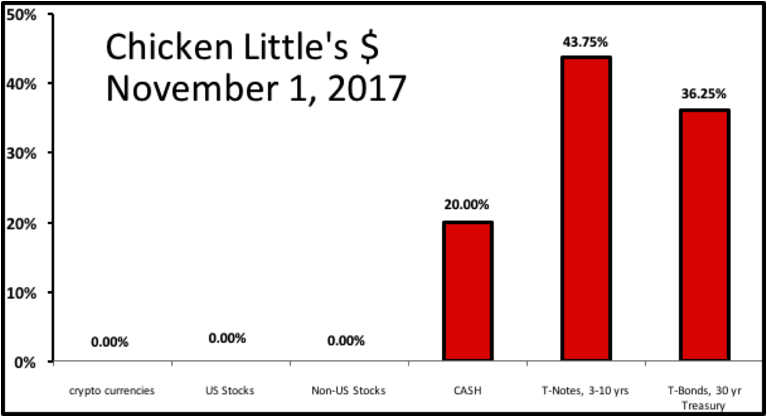 As of November 1, 2017, Chicken Little is long US Treasuries with a good amount of cash. In October 2017, Chicken Little sold all his equities and cryptocurrencies. Chicken Little got lucky with bitcoin and other cryptocurrencies by doubling the investment in a few months. Chicken Little's position in cryptocurrencies violated his own rules of momentum and conviction. Bitcoin certainly has momentum, but Chicken Little does not have sufficient conviction. An investor who violates his own rules deserves to lose. Chicken Little is ready for a bear market in risk assets. This sounds brave until one realizes that clearing the deck is often accompanied by warfare, failure, and death. Indeed, the photo at the start of this post is of the deck of the HMS Victory, flagship to Lord Nelson in the Battle of Trafalgar. 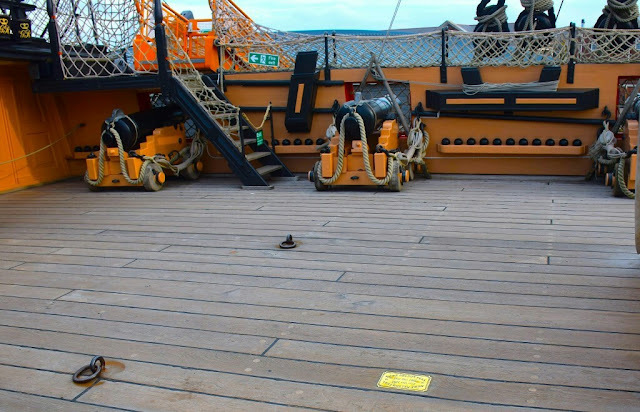 The HMS Victory survived the battle, but Lord Nelson was killed. The start of the bear market in stocks and other risky investments continues to lie beyond the horizon.